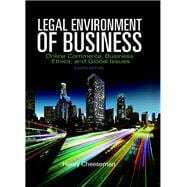 For undergraduate courses in the Legal Environment of Business. Cutting edge cases and comprehensive coverage of the legal environment of business. The Legal Environment of Business: Online Commerce, Ethics, and Global Issues examines how the current legal environment, government regulation, and e-commerce environment impact today's business decisions. The cases in this text are cutting-edge, exciting, and engaging, and the reasoning of each case is presented in the language of the court. The Eighth Edition is updated with all new cases, statutes, and features. &>Henry R. Cheeseman is professor emeritus of the Marshall School of Business of the University of Southern California (USC), Los Angeles, California. Professor Cheeseman earned a bachelor’s degree in finance from Marquette University, both a master’s in business administration (MBA) and a master’s in business taxation (MBT) from USC, a juris doctor (JD) degree from the University of California at Los Angeles (UCLA) School of Law, a master’s degree with an emphasis on law and economics from the University of Chicago, and a master’s in law (LLM) degree in financial institutions law from Boston University. Professor Cheeseman was director of the Legal Studies in Business Program at USC. Professor Cheeseman taught business law, legal environment, and ethics courses in both the MBA and the undergraduate programs of the Marshall School of Business of USC. At the MBA level, he developed and taught courses on corporate governance, securities regulation, mergers and acquisitions, and bankruptcy law. At the undergraduate level, he taught courses on business law, the legal environment of business, ethics, business organizations, cyber law, and intellectual property. Professor Cheeseman received the Golden Apple Teaching Award on many occasions by being voted by the students as the best professor at the Marshall School of Business of USC. He was named a fellow of the Center for Excellence in Teaching at USC by the dean of the Marshall School of Business. The USC’s Torch and Tassel Chapter of the Mortar Board, a national senior honor society, tapped Professor Cheeseman for recognition of his leadership, commitment, and excellence in teaching. Professor Cheeseman writes leading business law and legal environment textbooks that are published by Pearson Education, Inc. These include Business Law, Contemporary Business Law, and The Legal Environment of Business. Professor Cheeseman is an avid traveler and amateur photographer. The interior photographs for this book were taken by Professor Cheeseman.